E chose to do two gnomes yesterday while W chose a bear. This morning as soon as they woke up they wanted to do more felting. We now have a whole...flock?...passel?...gaggle?... gathering of gnomes in various stages of completion. 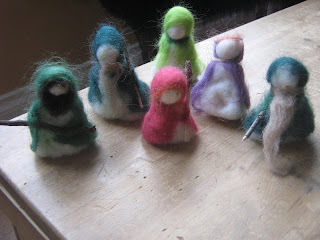 There are big plans in the works to create a whole village of felted people. I'm working on them to consider a Star Wars theme (I want to make Chewie ) or at least a Harry Potter theme. What fun! Isn't it amazing what you can do with a bit of wool and a (sharp!!!) needle. I’m sad to say I’m leaving Four Friends and a Blog to concentrate my energy on my own blog, Nicola Knits. 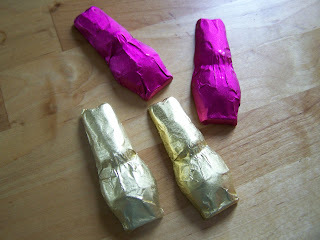 I’ve found that it’s a whole different can of worms posting to my own blog, and I like it! My new blog hasn’t been featuring a lot of knitting lately. It’s become more introspective and personal, but I find that when I read other people’s blogs I appreciate hearing the more personal stuff - it makes me feel like I’m really getting to know them. I like to know what the person looks like too. I know that a certain level of anonymity can be a good thing on the internet, and can be very freeing if you have a lot of controversial things to say, but I like the personal touch. There are so many things that I love about learning at home with my boys, so many benefits that I could never list them all...I probably couldn't even begin to understand them all. One benefit that has always been clear to me though is how close my children are because of this time together. Of course they have their moments of discord - who doesn't? But those are few and far between. E adores his big brother and W loves his little brother. Yesterday afternoon W went for dinner and a evening at the pool with a friend. E was sad when they left and spent some time on his own (I didn't know what he was doing) then he came up and seemed content. Later that night I asked him to get his jammies on; when he came up to brush his teeth he asked if he could phone W to find out when he would be home. I was just about to remind him that W was in the pool (not the best place for a phone call) when we heard the door open. E called out for W and ran to the door for a big hug and I could tell that W was pleased to be missed. Isn't that what we all want in life? To love, to be loved for who we are, and to be known? It made my heart so glad to see them. When W sat down for a second dinner (swimming makes you hungry, don't you know) E gave him another hug and a card that he had made earlier. Here it is. 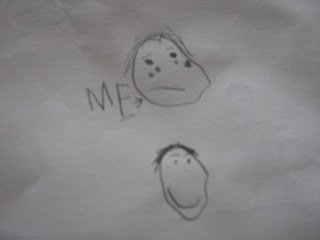 On the front is a picture of E with tears because he is missing W. Inside are pictures of both of them going out to bounce on the trampoline together. See the happy faces? When you ask people what is the most important thing in life, most people will say their family, their health, their friends/sense of community. If someone were to ask me what my kids are learning by "homeschooling", I think that I could say that they are learning one of the most important things life has to offer. Just heard about this on Ravelry. Saturday June 14th. How about it, girls? One of the traditional dishes from Jersey, the little island where I grew up, is something called Bean Crock. This is just a bean casserole, cooked slowly overnight in the oven. Traditionally of course it would have had a ham bone in it, but not in my house! My mother-in-law still cooks it like that, but after soaking the beans overnight (this time I used pinto, navy and black-eyed peas, though any will do) I blast them for at least an hour in the pressure cooker with a chopped up onion, a couple of bay leaves and a lot of stock. The plan is to have lots of liquid at the end for dipping your bread. Really simple. I made a batch of bread today (hey, I actually found wholewheat bread flour at the health food store this morning - and I found out why they didn't have any last time - they only order in THREE 2 kg bags of it per WEEK - good grief, I can easily use that in my house alone). Three loaves were plain and the fourth I made into a sort of cinnamon spiral bread. A lazy way of doing cinnamon buns! Actually it could have done with more cinnamon and more sweetener, but it wasn't bad. 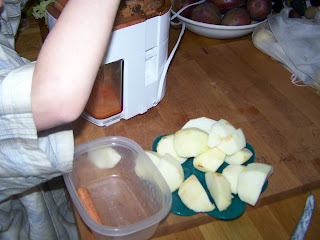 Awhile ago I bought a huge bag (25lbs) of organic juicing carrots. 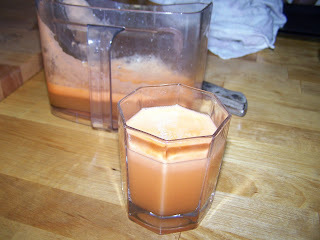 I thought I would start making myself some fresh apple/carrot juice each morning. E decided that he would help with the first batch. And I've hardly got any since. I am one of those people who learns the basics of a new piece of technology, just enough so I can use it without looking like a total idiot. However my children will take something new, like a digital camera, and check out every single feature. They can make the camera chirp or click, they know what each little symbol means, and they can produce weird images like these by choosing a particular setting and waving the camera around while they take a photo. Thanks to S (aged 9) for the modern art. but today they are shivering under a few inches of surprise snow and it's minus one Celsius! 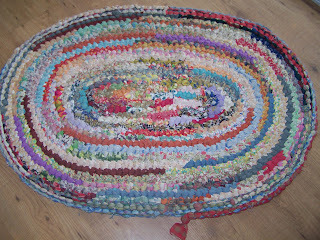 Rag Rug for free to good home. Well, I've posted about my love of rag rugs before here, and how I make them here. But, this is even better than making them, today as we were leaving the thrift store the boys spotted a rag rug by the door. We opened it up and I oohed and aahed over the colours. Then W said, "Look, there's a sign that says free." Well, not much to think about there, is there. We rolled it back up and brought it home to live with us. *One day I really will write an ode to thrift stores. **Nicola - did you drop that off there? It seems appropriate, after Katherine's mention of getting kids out in nature, to tell you about our hike this afternoon. We went to a Regional Park that we've visited before, but this time we pressed on, following the creek further up than ever before, and found more waterfalls. It was perfect hiking for boys, though we did have some adventurous girls there too. Ups and downs, fallen logs everywhere, rocks and treeroots to master, slippery slopes and a creek. A couple of scrapes were suffered by two of the boys and there were a few wet feet, but mostly it was a lot of fun. And the sun shone. S sitting above a steep drop of about 12 feet to a deep pool. Sad to see the foam on the water and a few plastic bottles lying around - evidence of human pollution. The same waterfall, seen from above. The boy on the right had just sent a log down the flow of water. I never fail to feel gratitude for my ability to enjoy hikes like this, with its climbing and scrambling and enjoyment of the use of my own muscles. It feels so good. I want to recommend this book: I grew up on the land. I had a childhood spent playing, exploring and just "being" in Nature. Unlike my own rural childhood, my sons have been raised in the city. That means that instead of living right in a completely natural setting, we have to leave our man made environment and travel (luckily for us it's walk or bike ride away in proximity) to the woods. It is something we have done throughout their childhood and continue to do, as we feel it is important our boys have time and place to roam and explore the natural world. "Unlike television, nature does not steal time; it amplifies it. 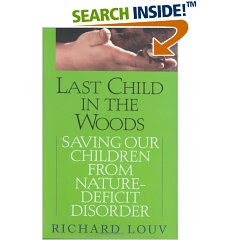 Nature offers healing for a child living in a destructive family or neighborhood. 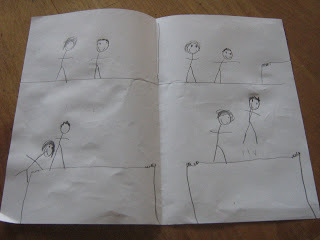 It serves as a blank slate upon which a child draws and reinterprets the culture's fantasies. Nature inspires creativity in a child by demanding visualization and the full use of the senses. Given a chance, a child will bring the confusion of the world to the woods, wash it in the creek, turn it over to see what lives on the unseen side of that confusion... In nature, a child finds freedom, fantasy, and privacy: a place distant from the adult world, a separate place." I found this book to be insightful. It also carries a warning. If we keep on as we have been over the past decades, in the way we have treated and viewed the natural world, we will not only be losing our environment. We will lose our future - our children. We all need the natural world. Lizzie from Lizzie's Loose Ends. She entered my Airplane Knitting Contest and can be grateful that the first name drawn didn't have a contact email/blog and I haven't heard from them since I posted their name (twice)! So, Lizzie, I have emailed you via your blog to let you know, and am just waiting to hear from you with your address. an I-cord bracelet knitted from silver wire and beads. 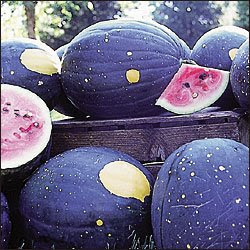 Last night I was in bed reading Gardening With Heirloom Seeds when I saw a picture of the Moon and Stars watermelon. As soon as I saw it I knew that E would want it. He had already started some watermelon inside but I thought if he knew about this kind he would gladly pass his seedlings off to his Grandma. I showed him the picture this morning and he could not wait to order it. What a gorgeous melon, and since E is the king of watermelon growing in our family, he should have no troubles with it. I love the name Moon and Stars too. Do you remember in the film of The Indian in the Cupboard when the cowboy (David Keith, ahem) says that children are the moon and the stars? What a lovely saying. And what a cool looking watermelon. A distant cousin of my husband's lives in Thailand, and every now and then we get a slew of emails from him - all jokes! Why is it stores that are open 24/7 - 365 days a year have locks on their doors? For you, Shelia, or any other avid gardeners. Can you tell what this is? The front yard already smelled lovely with all the violets in bloom, but now it is just incredible with all the hyacinths starting to bloom too. And...where there are flowers there are bound to be bees and wasps. We spotted a few on Friday afternoon. When I get up in the morning (usually about 9am) my eyes are half shut, I grab my big fleece dressing gown and shuffle into my slippers to go to the kitchen to make myself some rooibos tea. Usually the house is quiet. R has already gone to work. L has usually been up all night on his computer and gone to bed for the day. K and S often stay up late and don't get up until 10-ish. Today I'm sitting here in the family room at 9.40am and all the kids are here, L's music is playing on his computer and the smalls are playing with the Lego. What went wrong? I love the peace and quiet of the first hour of the day, drinking my first cup of tea, and I don't like doing anything for anyone else until I'm properly awake. L hasn't been to bed yet - he's been up since just before dinner last night. The smalls weren't too late to bed last night, as R and I have decided that leaving them up to play just results in us being disturbed. So the lights were out in their rooms when I went to bed. This morning, I had just got up when S came in and proudly told me he'd been up since 5am. He does this every now and then. He was dressed and his teeth were brushed. K was up but in his pajamas. So much for my peaceful start to the day! Yes, yes, as a former West coaster I'm sure that I should be embarrassed to admit it, but it is true, I did plant blackberries. Where I grew up we spent years fighting a never-ending fight against blackberries trying to take over our property. We used to whack away at them and I am pretty sure that I remember my dad running them over with a ride-on lawnmower at times. But...I love them, and my sons do too. 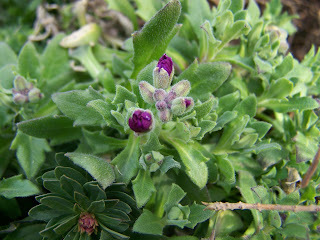 So we must have them, and what better way than to plant thornless ones in our own garden. 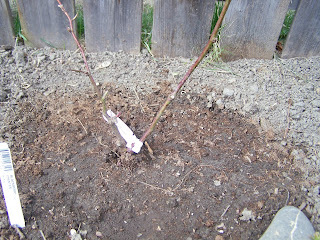 So with the space freed up from the blueberry rescue, I decided to put the more resilient blackberries in. We will see if they can prevail over the dogs. As a perfect follow-up to my last post, this is what arrived in the mail today. It's a very sturdy, colourful bag made from folded candy wrappers that I won from Nan in a previous contest. I can't imagine how many hours this took to make. I shall use it with pride and I'm sure it will attract many curious looks! My kids and I had fun spotting the tiny bits of writing and logos on the wrappers. PS: I forgot to mention that if you read about her contest here and you go and enter, please mention my name because then I get an extra chance to win! Nannybird is having her 222nd blog entry contest, and you can win a $25 gift certificate to the hobby store of your choice. Wouldn't THAT be worth winning?! To enter, you need to go here and leave a comment, telling her what your six word philosophy of life is and why. If you have a blog, then post about it for another chance to win. I posted last week that the winner of my little prize for the airplane knitting was Noble Retrievers, but I haven't heard from them. There was no contact information so I'm relying on that person emailing me. If I haven't heard anything in the next few days, I'll pick another name...one that has a contact email or blog where I can leave a comment. Yesterday I really felt like Spring was here - I was doing my housework and went outside to take something to the garbage can, and the sun felt hot. (The temperature was about 13 degrees Celsius!) The back of my house faces south, so it's quite a suntrap. Later I did a couple of loads of laundry and I decided to hang it out on the clothesline. It dried well, and the showers that threatened on the horizon never made it as far as my house. I love drying clothes outside - it's so pleasant walking down through the fruit and nut trees to the spot where I have my rotary dryer set up. And I have the added bonus that it's free and environmentally friendly! 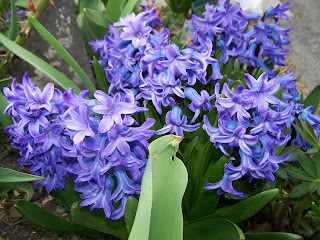 These blue beauties are rewarding to see while doing my spring yard work clean-up ( I know, I know, I'm slow). Maybe I'm pacing myself? Anyways, the temperatures outside are still chill enough to make it rewarding to come inside and warm up with a bowl of this tasty soup. Don't let all those beans scare you off. Just put some seaweed in your soup. Adding kombu to the soup does seem to help with the gas factor caused by the beans. 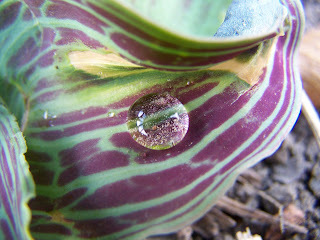 We had a sprinkle of rain while I was still out in the garden. My husband called from the garage, "You do know that it is raining, don't you?" "It's just a sprinkle," I replied. "And come look!" I called. 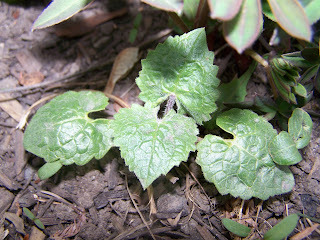 There were little drops of water caught in the leaves of some of the plants. We took some pictures. These ones are hubby's. Shortly afterwards there was quite a downpour, all the better to water in my new blackberries. My husband found this dead mouse in our shed yesterday. It must have climbed into a large paint bucket and been unable to escape. After my exclamation of sympathy, he suggested I might want to photograph it for the blog, which I thought was a great idea (he knows me well)! One of the boys grabbed the camera and took a photo, then proceeded to make a little grave marker with a piece of wood and a permanent pen. If you click on the picture, you'll see the words better. 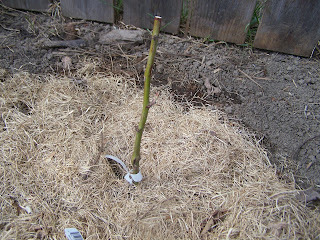 The mouse's little body is now interred underneath our forsythia bush, which is just coming into bloom. 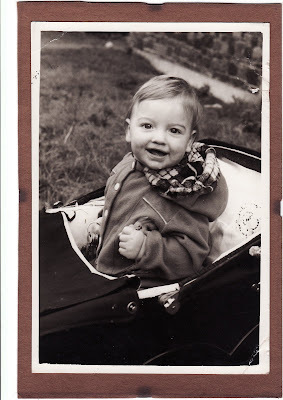 I have finally taken the plunge and set up my own blog, Nicola Knits. When the four of us set up Four Friends and a Blog at the beginning of last year, I'm sure we had no idea we'd have so much fun with it. We knew nothing about blogs at the beginning, but soon learned, and our readership has grown satisfyingly and is being maintained at a good level. However, I've been wondering about its potential for continued success for some months now. First Katherine started up her own blog, and then Heather. All those lovely quilting photos and garden photos are appearing on their blogs, and our communal blog is the poorer for it. As you know, I tend to post a lot, but now that I have my own blog I'll have to consider how to divide my time between the two. Certainly, any rants that might offend will be confined to my own ;o} And knitting posts will probably now appear on Nicola Knits, which also happens to be my Ravelry ID. I hope you find the time to come and visit my new blog - but keep reading Four Friends and a Blog too! Finished at last! I have been letting these languish in the knitting bag, but the deadline was looming so I had to finish them. I have tossed these into the washer this morning and am hoping that a good tumble in the dryer will soften up the acrylic. Note to self: only knit with yarn I love. I know, I know...Easter is over. But, look what was on sale at the check out of my local health food store. 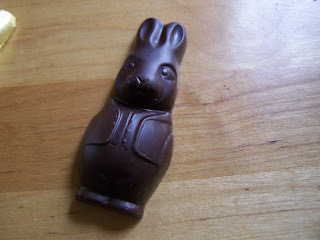 E ate his and then says to me, "That's good chocolate." 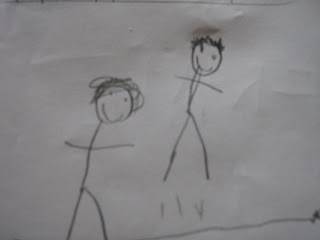 You see how much my kids are learning with this whole homelearning thing? Brilliant, I say. I made this Floppy Rabbit today for a friend’s 1 year old twins. I bought the Bernat Soy yarn with the intention of knitting two Tomtens (see photo at the bottom of this post). Well, only one was knitted in time for the children’s birthday, so I decided to make this toy with the three colours I had left. It was inspired by a rabbit that my sister was given as a child - I still remember it - I loved its long legs. I didn’t start with full skeins, but I expect you could knit this with one skein each of the oatmeal, seasalt and celery. Or just make it all one colour. I used Keyplate #2 on my Bond Classic knitting machine. I made it up as I went, with no gauge swatches or measuring, so feel free to adapt it as you wish. My toy measures about 27 inches tall. The arms seem just right, being about the length of the body, and the legs are extra long, on purpose. Repeat last four rows (from *) until there are 14 sts, ending with the two even rows. Repeat last four rows (from **) until there are 4 sts left. Sew around all pieces, stuffing gently as you go. I made sure my seams were on the centre back of the head and body and the underside of the limbs. When sewing up the head and body, I rounded the corners a little. Sew the head and limbs to the body, and the ears to the head. Embroider features. Yesterday I was out fiddling about in the garden. I planted more peas and wandered about looking for some sign of sprouting action in my veggie garden beds. 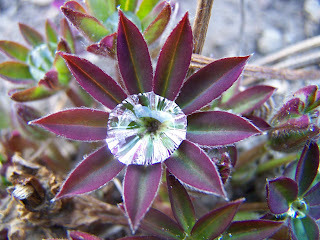 Am I just getting more impatient every year or is it actually a colder, slower-to-sprout Spring than normal? Next year I am doing a cold frame for sure. I want to be eating my own lettuce and spinach already. 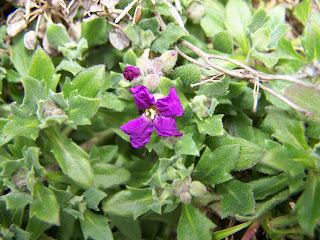 I did come across this little bloom on some of my rock cress. 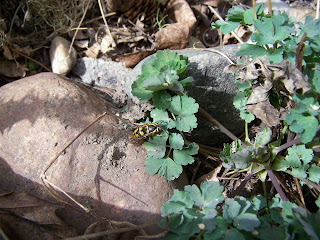 It was tucked in near a rock on a small stone wall that we have. Seems like I just can't shut up today! First, I'm going to whine about my day, hobbling around like an old lady. I woke up at about 4.30 this morning with a pain in my back, and whatever position I tried to lie in, it hurt. I have had to miss Taekwon-do tonight and have been moving slowly all day, occasionally wincing at the recurring pain. I assume I strained something while trampolining with the boys on Tuesday - and for some reason it took until Thursday to make itself known! Hopefully, it will be better soon. I cleaned out the small freezer above the fridge yesterday - THAT job was way overdue. Once I'd emptied it and given it a good scrub, I only put back the stuff I really wanted to keep. Some old tomato soup went into the compost bucket along with some 5 year old habanero peppers and some commercial sweetcorn which we never eat. I put three bags (about 9lbs) of homegrown prune plums into a large bowl to defrost, and this morning I made them into two plum crumbles. Good breakfast food! And I am delighted to announce that my Sunrise Circle Jacket is 100% finished - not just the knitting, but the buttons too. I found some lovely glass buttons at my LYS the other day and I can now wear the jacket. Yippee! Aren't these such cute faces? Of course, I am totally biased - they are me and my husband as babies! I scanned these old black and white photos in last night....and I'm glad I did, because if the photos ever get damaged, I'll have them on my computer. 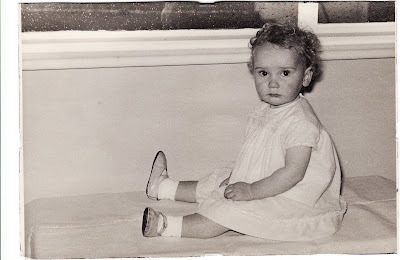 Now I'm challenging my blog partners to show us photos of them and their dear husbands as babies or children.